Cody marvels at a franchise course correction. According to an online dictionary, "Ragnarok" was an event in Scandinavian mythology that would mark "the destruction of the gods and of all things in a final battle with the evil powers". Basically, it's another word for "apocalypse", and when it was announced that the new installment in Marvel's Thor franchise would be titled Thor: Ragnarok, a lot of fans instantly assumed that the film would be dark and deadly serious. It's a logical assumption to make, especially when paired with the horrific visions of the future Thor (Chris Hemsworth), god of thunder and Avengers superhero team member, was experiencing in Avengers: Age of Ultron. If the movie was going to deal with the potential destruction of Thor's home world Asgard, that sounds like pretty serious subject matter. So it was surprising when Taika Waititi, best known for his work in comedy, was hired to direct the film. Then came the news that this apocalyptic tale would indeed be quite funny. These choices went completely against expectations... and while a dark and serious take on the concept might have been good, I wouldn't trade it for the goofball film we ended up getting. Taika Waititi's Thor: Ragnarok is a hell of a lot of fun. The Thor movies have never been my favorite part of the Marvel Cinematic Universe. I found them entertaining, but underwhelming compared to the other Avengers' films. They weren't highly regarded in general, so it made sense to shake things up, and Ragnarok does that in a major way. Over the course of the story, everything the previous films set up as regular elements of the Thor series gets taken apart piece by piece. Thor loses his hammer, his hair, his father, and more. Supporting characters are written out or slaughtered. Locations are destroyed. Nothing is going to be the same for this character from here on out. Except for maybe his attitude. The film picks up two years after Age of Ultron, and while his buddies have been having a Civil War with each other on Earth, Thor has been unsuccessfully searching the cosmos for the Infinity Stones, powerful items that have played a part in previous MCU films, building up toward a major Avengers film down the line. Those are made irrelevant for the moment when Thor encounters a creature called Surtur (voiced by Clancy Brown), who says it is prophesied that he is the one who will bring about Ragnarok. Our hero is told that when Surtur's crown is placed in an eternal flame that burns in Asgard, Surtur will grow as big as a mountain and destroy the entire world. Cue Led Zeppelin's "Immigrant Song" on the soundtrack so Thor can make quick work of Surtur and his evil lackeys in a rousing, heart-stealing opening action sequence. "Immigrant Song" is used in this film twice, an awesome song from my favorite band that fits the Thor character perfectly. From there this movie has to quickly pick up the pieces that preceding films have left lying around. It's revealed that Thor's mischievous, sometimes villainous adopted brother Loki (Tom Hiddleston) has been ruling Asgard for years while disguised as their father Odin (Anthony Hopkins), and with a quick assist from Doctor Strange (Benedict Cumberbatch in a cameo) they're able to locate the real Odin on Earth, in Norway... Just in time to see the ancient god die. Odin's death paves the way for the arrival of a sibling Thor and Loki didn't even know they had. Odin's first born: Hela (Cate Blanchett), goddess of death. Banished by Odin for her evil ways, Hela is now free to attempt to claim the throne in Asgard, and some of the choices Loki has made there - like casting out the noble Heimdall (Idris Elba) and replacing him with the skeevy Skurge (Karl Urban) - make it easier for her to pull off her coup. It also helps that Hela manages to fling Thor and Loki off to a planet called Sakaar, trapping them there while she wreaks havoc on Asgard. On Sakaar, Thor is captured by a woman at first known only as 142 (Tessa Thompson), who takes him to the planet's ruler, Jeff Goldblum as the Grandmaster. Goldblum has jokingly given this film a positive review of "10 out of 10 Goldblums", which is fitting because this is Goldblum operating with his typical quirks turned up all the way, to a 10 on a scale of 10. If you're a fan of his, it's a wonderful thing to behold. For the entertainment of himself and his people, the Grandmaster has put together a Contest of Champions, gladiatorial matches fought between whatever alien warriors Grandmaster happens to capture. Thor is pit against the reigning champion... and that's when it's revealed, as spoiled in the marketing materials, that this isn't only a Thor adventure. This also functions as an adaptation of sorts of the popular comic book storyline Planet Hulk, in which the Hulk was forced to be a gladiator on a far-off planet. Rumors of a Planet Hulk adaptation being in the works were swirling around during the production of Age of Ultron, and here the adaptation has happened in an unexpected way. Since Universal holds the rights to distribute any solo Hulk features (as they did The Incredible Hulk) but the rest of Marvel Studio's films are distributed through Disney, the choice has been made to tell a Hulk story through the character's appearances in team-up films. If Marvel had just made a Planet Hulk movie, Universal would be the studio putting it out. 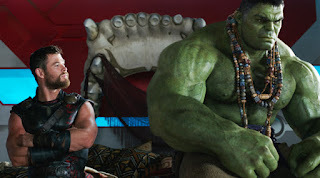 Here they were able to bring the concept of Planet Hulk to the screen, but in house at Disney and with another Avenger in the mix. Even though this section of the film is based on a Hulk story, Thor remains the star. Now he just has a buddy to hang out with. After they have a brutal brawl. Mark Ruffalo reprises the role of the Hulk, which he played in The Avengers and Age of Ultron. But this Hulk is slightly different than the raging green monster we know from those movies and The Incredible Hulk. When we catch up with him, it's been two years since the Hulk reverted to the human form of Bruce Banner. He has only been the Hulk for all this time, so his vocabulary has expanded slightly - to about the level of a toddler. Eventually Banner is brought back to the surface, and there's a fear that if he becomes the Hulk again he'll never be able to revert back to his normal self again. That allows for some fun with Ruffalo playing a Banner who is very nervous and afraid of being set off. He desperately doesn't want to Hulk out again... but Thor kind of needs the help of the Hulk to deal with the Hela problem. To escape Sakaar and take on Hela, Thor also enlists the aid of his always-scheming brother Loki, an insect warrior called Miek, and Korg, an easy-going rock-man character hilariously voiced by Waititi. Also along for the ride is 142, who is revealed to be a Valkyrie warrior from Asgard. Thompson is a lot of fun as the Valkyrie, who is drunk for much of her screen time and proves to be a very capable ally. 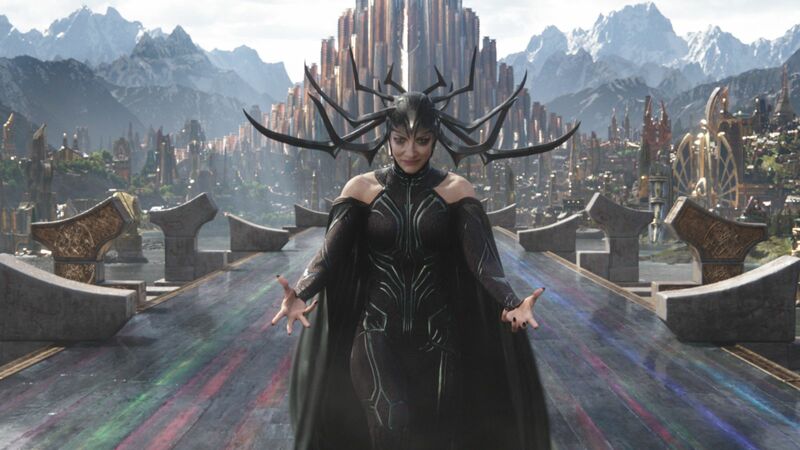 Also a lot of fun is Blanchett, who was clearly enjoying the chance to chew up the scenery as Hela. Her side of the story does kind of get overshadowed by all the Planet Hulk shenanigans, but she makes a strong impression with what she was given and Hela is a very formidable adversary. Led Zeppelin kicks in again when Thor and his "Revengers" go into battle against Hela, her army of undead soldiers, and her giant wolf Fenris, making sure that the film ends in a way that's even more exciting and satisfying than its beginning. By defying expectations at every turn - the choice of director, the tone, the substance of the story - Marvel managed to do something with Thor: Ragnarok that I hadn't anticipated. 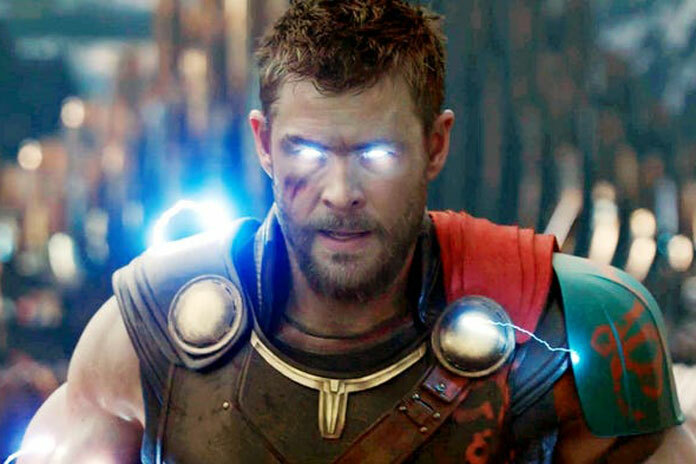 They made a Thor entry one of the most enjoyable entries in the MCU. I could nitpick the opening stretch, as much of the stuff in there feels obligatory - no matter what this movie was, it would have to deal in some way with Loki having stolen Odin's identity and sent Thor's father away. Ragnarok gets through that as quickly as possible, moving through those scenes at lightning speed. Once that's all out of the way, once Hela's on the scene and Thor is on Sakaar, that's when the movie can truly start telling its own story rather than complete previous stories. That's when it really gets fun. 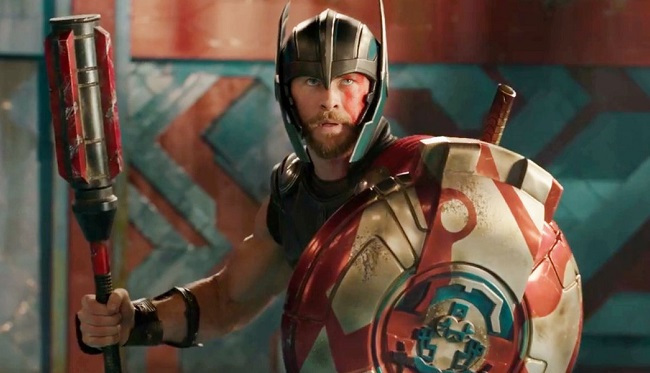 It keeps the laughs coming, contains a whole lot of action, and Hemsworth turns in his best performance yet as Thor. The guy's still a bit of an arrogant buffoon, but he has truly embraced his role as a hero now, so he's an arrogant buffoon you can root for with more enthusiasm than ever. Hemsworth has said that he based his portrayal of Thor on Kurt Russell's performance as Jack Burton in Big Trouble in Little China, and I can see that in the way he retains his swagger even when he's being repeatedly shown up and undermined. 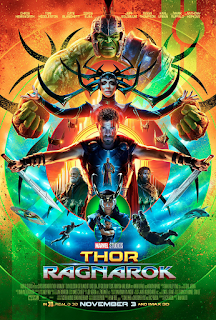 I saw Thor: Ragnarok in Brazil with the blog's own Priscilla, and even though comic book movies aren't generally her thing, she found this one to be entertaining. Myself, I thought it was a blast, and it's definitely going to be one of the MCU movies I return to most often.